Although one of baseball's best hitters and a multi-time Gold Glove winner, Adrian Gonzalez has largely avoided the hobby spotlight. In fact, he had some of the biggest buzz among collectors years before he played in his first MLB game. 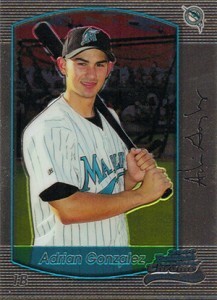 The first pick in the 2000 draft, Topps was quick to include Adrian Gonzalez rookie cards in the products, including him in their various Topps and Bowman update sets. Since then, he has been a key component of several trades and has yet to make his mark as the face of a franchise. 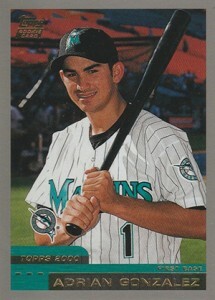 The Marlins gave up on Adrian Gonzalez quickly, trading him to Texas in June, 2003. He made his MLB debut with the Rangers the following year. However, Gonzalez didn't stick with the team for long. Following an insignificant 2005, Gonzalez was sent to the San Diego Padres where things changed in a big way. In five seasons with the Padres, Gonzalez hit 161 home runs and was the team's offensive cornerstone. Despite this, he was traded to Boston in 2011 where he lasted less than two seasons despite driving in more than 100 runs both seasons. Late in 2012, Gonzalez was part of a blockbuster deal with the Los Angeles Dodgers. There, he has continued his elite-level hitting, leading the National League in RBIs in 2014. It might not be long before collectors finally warm up to Gonzalez. Barring a major injury, he'll likely reach 400 home runs with 500 not being out of the question. That might not mean what it once did, but it is significant. If he hits these milestones, it will solidify his place in the game and should bring him more attention in the hobby. For a player at his level, there's currently not a lot. Despite playing for so many teams, Gonzalez has yet to win a World Series either. That also takes something out of his hobby appeal. That said, there's a much lower risk for key Adrian Gonzalez cards than a lot of other players and prospects. He's a proven hitter that remains affordable. Collectors have four Adrian Gonzalez rookie cards to choose from. All are from boxed factory sets. 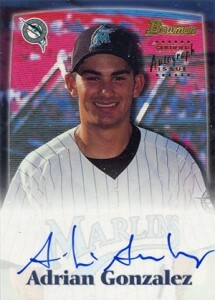 The 2000 Bowman Draft set also has randomly inserted autograph cards from the former first overall draft pick. Not that any of the Adrian Gonzalez rookie cards are expensive, but this is often the most affordable. Like all of his rookie cards, it was only available inside a factory set and not in packs. In a lot of instances, the base cards from the 2000 Bowman Draft set are overlooked in the hunt for key autographs. 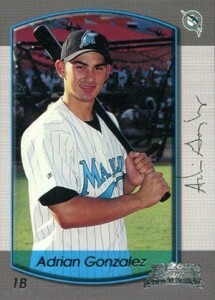 While not a rookie card in the traditional sense, this is a cornerstone card in any Adrian Gonzalez collection. It's definitely the most valuable and coveted of his early cards. Every 2000 Bowman Draft box set came with one autograph. Gonzalez has emerged as the top card in the product. That said, it's still not overly expensive. If Adrian Gonzalez cards make a run, this is going to be the one leading the charge. Without an autograph or any other inserts, the 2000 Bowman Chrome Draft factory set relied on the premium nature of the brand as a selling point. 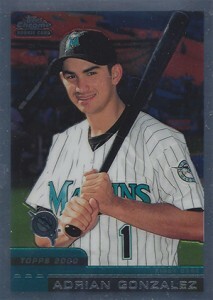 As far as Adrian Gonzalez rookie cards go, this is the top choice. It has the same basic design as the base Bowman card but done on chromium stock. 2000 Topps Traded marked the second year that the update set was brought back as a boxed set. Most of the attention is on Miguel Cabrera so even a player of Gonzalez's caliber slips under the radar. Similar to how the Bowman Chrome Draft trumps regular Bowman, the 2000 Topps Chrome Traded Adrian Gonzalez is more valuable than his basic Topps Traded card. That doesn't make it expensive. In fact, the premium isn't a huge one.